Common dreams tend to have two different types of meanings: a general meaning where the dream is told as a symbolic story and an individual meaning, which is specific to the dreamer. 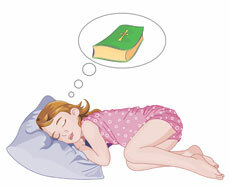 Common dreams often mirror real life experiences but can also include fantasies. Common dreams can link to actual experiences and sensations i.e. when a phone is ringing in reality the dreamer might hear this in their dream. Studies of common dreams have found that about three quarters of dream content or emotions are negative. The above links provide the meaning of dreams and dream interpretation.